"You know, those in the Midwest are some of the hardest working people in the United States," said Bobby Schilling, Republican candidate for Congress, as he questioned why companies are not considering Illinois as a place to bring their businesses. Schilling and other Republican candidates, ventured out in a snowstorm February 15th to talk to Republicans and to honor America's 16th President at the annual Lincoln Day Dinner. 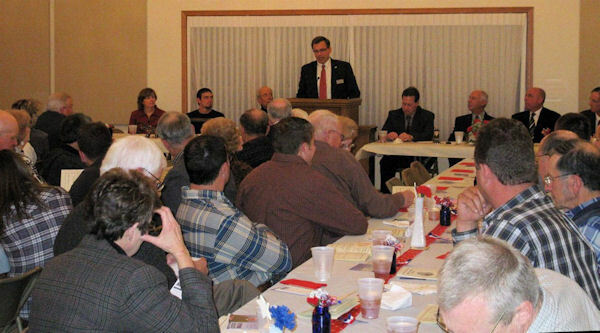 The event was catered by R&D Foods of La Harpe and was held at the Terre Haute Fellowship Hall. Schilling said that ADM (Archer Daniels Midland Company), headquartered in Decatur is looking at making a multimillion dollar expansion, but Illinois is not on their list to locate. Also, Maytag, who left Galesburg in 2003, is looking at coming back to the United States after it took its business to Mexico, "and we are not on that list either. We need to do something about it!" Schilling from Rock Island County, lives with his wife Christie of 24 years with their 10th child born two weeks ago. Their oldest, Terry Schilling, is a political science graduate and is his dad's campaign manager. After Schilling graduated from Black Hawk College, he worked for Container Corporation of America, and Prudential Insurance of America giving him some union background and some financial services background, and for the last 13 1/2 years he has run his own pizza business in Moline. Schilling said, "There are several good reasons I am running for Congress - 10 really good ones are for my children, but one of the biggest reasons is that the same politicians that have put us into this great mess we are in have continued for the last 30 years saying they are going to get us out of this mess, and I don't think that is going to be true." So a year ago, Schilling began his race. "We have a Congress that every time they run out of money they lift our debt ceiling up. The last increase was 1.9 trillion dollars. The out of control spending that is going on in Congress needs to stop!" Schilling said at our house if we were maxing out our credit cards, we don't call them back and ask them to put another $10,000 on it. We stop spending money, and Congress has to stop spending money because they are bankrupting our kids and grandkids with no ways or means of paying it back. The only thing that can come out of out-of-control spending is increased taxes. When you have an economy like we do today and you start increasing taxes on businesses and people, that's going to throw us into a depression." "I don't want to throw any scare tactics out there because this is what I believe. I believe the private sector, that is us, the people right here in this room, will be the ones who get us out of this great huge mess we have gotten ourselves into. It can not be the government. Shilling says he has a real problem with the government saving or creating jobs. The only jobs the government can create are temporary. The thing the government can do is create an atmosphere that allows us in the private industry to go in and get this economy back on track by getting out of our way. I understand we have to be able to spend money but there is appropriate and inappropriate spending. $30,000,000 for swamp mice in California is inappropriate spending. If we have to do some road work, I understand that. That's the problem we have today. These guys are on a shopping spree that's not stopping and we need to stop that." Our founders set this up for average folk, like everyone in this room, to take their tool belt off, go in and serve this great nation 6 or 8 years and then come back home and get back to work. It was not set up to serve 20, 30, and 40 years. "My Opponent is what I call a career politician. I have signed a contract with the people I am going to be representing. "Taxpayers will not fund my families health insurance. "Congress after 5 years gets a full-blown pension. I will not take a full blown pension. "Congress, in the middle of our recession, took a 3% pay raise while we have businesses struggling, closing down, and people out of work. I will not take any pay raises during my term in office. "I will not sign off on any bills which I have not read." What Congress needs to understand - if it can happen in Mass. it can happen in IL. My opponent said in the paper, "Look Schilling, this isn't Massachusetts. and I am not Martha Coakley" .I replied, "You are right. It is not Massachusetts but it isn't California either and you are more liberal voting then Nancy Poloski." "We are going to run a clean, crisp campaign. We are going to smoke this guy out on his issues. You can not be more liberal than Nancy Poloski and represent us here in Illinois. "We constantly hear it can't be done, but let me differ with the people who think that. Usually in a primary the vote is 55-65% to the Democrat and 35-45% to the Republican. This time the vote was 49.3% for the Republican Schilling and 50.7%. Nov. 27th a poll asked if the vote was today would you vote for the current Congressman Phil Hare. 39.5% said yes 47% no 13 undecided. As a seating congressman those are not the numbers you are looking for. I was born and raised in Rock Island County and I think we are going to bring that harder than its ever been brought before. The number one issue is jobs. If you have someone basically coming in on a coat tail of another and they have not been able to figure out how to create a job, and the only jobs they can create are the ones they bring 200 Alkida terrorists here to Illinois and they are saying it is going to create 3,000 jobs. "Now I am using my opponents numbers. If everyone of those make $30,000 a year that's $90 million the taxpayer is going to have to pay to take care of 200 people. Why don't we just leave them where they are at. Back when they were kicking out this 787 billion dollar stimulus package we were promised unemployment was not going over 8%. In Illinois it is over 11% and we have one of the most hostile political environments. We need to make an environment that is going to attract people back to our area.